PSNI Chief Constable George Hamilton has singled out the so-called 'New IRA' as the main dissident group behind recent violence in Derry. He said if the disorder continued it was only a matter of time before there was a fatality. 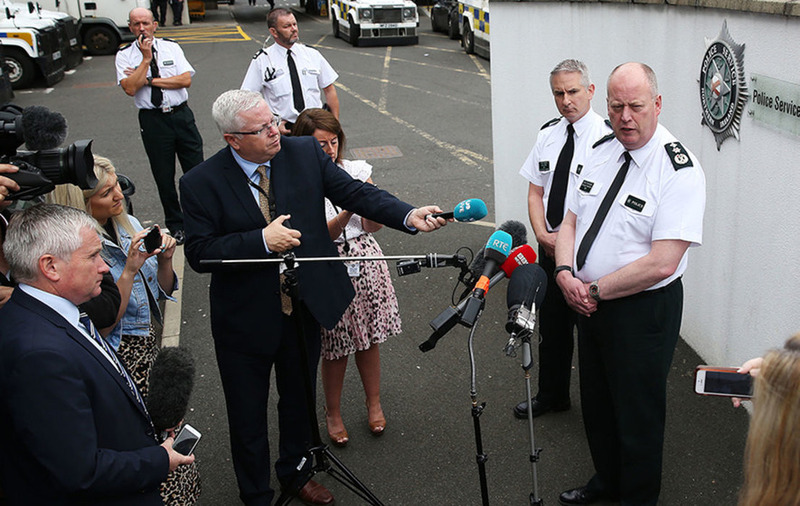 "We believe violent dissident republican groups are behind this, they will use whatever excuse they can to bring about unrest and to have young people involve themselves in violence against the police," Mr Hamilton said on a visit to Strand Road PSNI station in the city. "We believe there are members of a variety of dissident groups in this disorder - the so-called New IRA is the main group behind these murderous attacks on police. "We want to police with the community and protect people, we're working hard to maintain protecting people, locking up those responsible and bringing them before courts. "My fear is someone will be killed or seriously injured, we've already had police officers injured this week. It's only a matter of time before a police officer or a child is injured or worse." 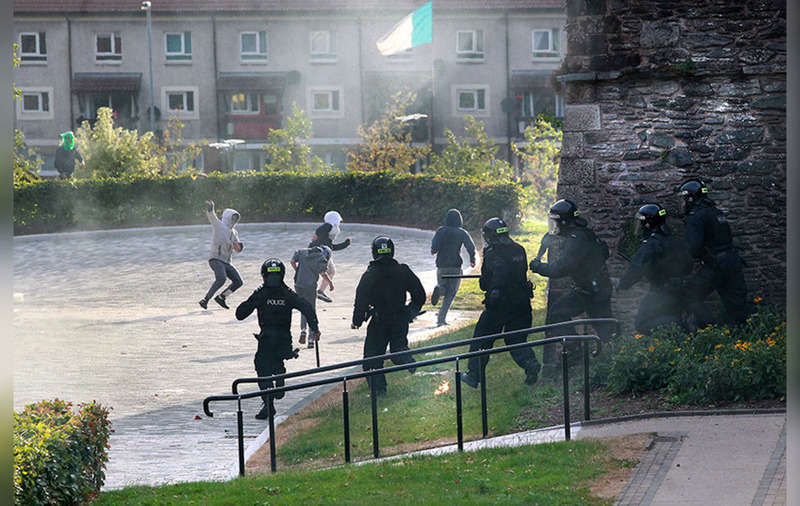 Explosive devices were thrown at the PSNI in Derry as rioting flared in the city for a sixth successive night. During a press conference today, Mr Hamilton was challenged on why police were seemingly reluctant to deploy officers into the Bogside during the rioting. He said those behind the violence were trying to draw police in. "We don't want to be fighting with anyone, we use balanced judgment when to go in and when to stay out and operational decisions are made on a routine basis," he said. "I'm not saying we always get it right but we certainly won't condone unlawfulness, we will pursue those who break the law and bring them before the courts." He also defended the use of baton rounds, highlighting that only four had been discharged in comparison with 200 petrol bombs being hurled at officers over the last week. "There's a long history of use of baton rounds in this jurisdiction and it is much safer now than previously," he said. "We don't want to use these against communities, we have to act in a proportionate manner, but we need full range of tactical options available to us." DUP leader Arlene Foster and Sinn Féin Foyle MP Elisha McCallion both tweeted that deaths could follow if the riots go on. The pair were among politicians who appealed for calm in the wake of last night's rioting. Community and youth development workers held a meeting in the Bogside today in an effort to find ways to prevent further violence. 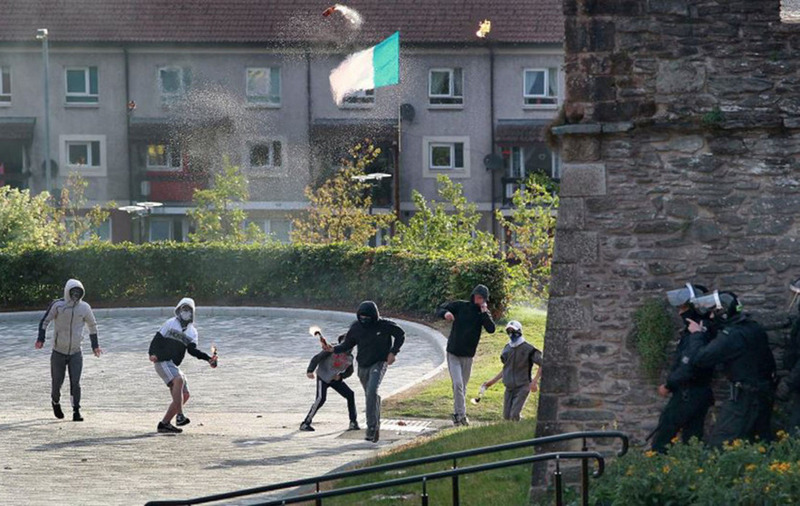 Young people in the Bogside threw two explosive devices and a total of 74 petrol bombs in what police described as a "prolonged and sustained attack". A fire was also lit on a main flyover. During the disorder, police fired four plastic bullets. A crowd of among 200 youths gathered as violence broke out at around 9pm yesterday. 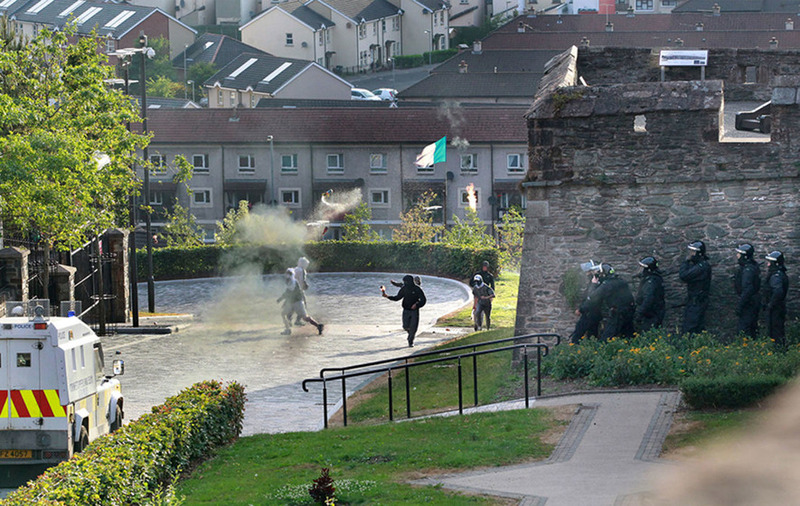 Some of the petrol bombs were thrown at passing vehicles but the majority were aimed at police stationed on the city walls overlooking the Bogside and on the Fahan Street interface. Police said three men aged 18, 22 and 50 were arrested. The 22-year-old man was detained for attempted murder. PSNI Superintendent Gordon McCalmont said it was a "miracle" that no officers were injured. He said the attacks were being "orchestrated" by older dissident republicans. “While we have seen many young people involved in these attacks over the last number of nights, it is clear that this is being orchestrated by a more sinister, adult, violent dissident republican element," he said. PSNI Chief Constable George Hamilton praised his officers and said the attacks must stop. "I’m calling on political and civic leadership to publicly voice support for police and condemn this violence before someone is killed or seriously injured," he tweeted. The latest attacks come after two pipe bombs were thrown at police on Wednesday night. Machine gun fire was also directed at officers on Tuesday night. 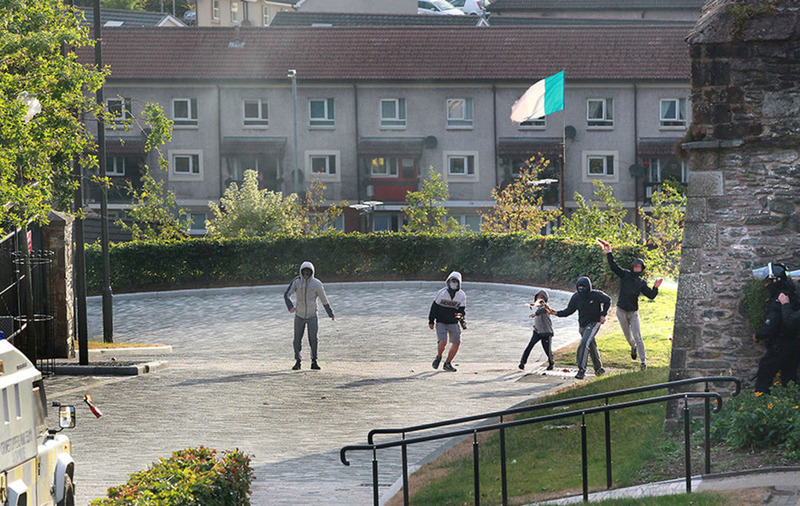 Rioters have also targeted homes in the nearby predominantly Protestant Fountain estate. 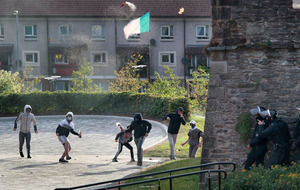 DUP leader Arlene Foster tweeted: "Really disturbing scenes last night in Londonderry. Someone will be killed if this continues. The main party leaders have jointly called for rioting to end. The police are risking life & limb trying to tackle this. All violence must be condemned." Really disturbing scenes last night in Londonderry. Someone will be killed if this continues. The main Party Leaders have jointly called for rioting to end. The police are risking life & limb trying to tackle this. All violence must be condemned. 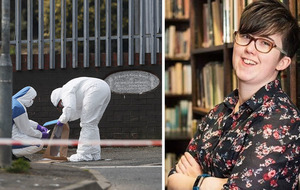 Sinn Fein MP for Foyle Elisha McCallion said: "This has got to end before someone gets killed." Listening to the concerns of an elderly lady tonight in the Bogside (who is quiet literally petrified) has left me both heartbroken and infuriated! This has got to end before someone gets killed! SDLP leader Colum Eastwood said the people of Derry refused to be "dragged back". "I don't know what any of this achieves, all it does is destroy our own community and send out a terrible signal to the world," he said. 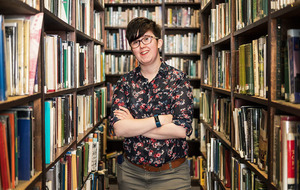 "But it's not the right signal - the people of Derry are moving on, they have moved on." Elderly residents again being terrified by rioters in the Bogside. The large crowd of spectators isn't helping. This needs to stop. Ulster Unionist MLA Doug Beattie said the violence was orchestrated by "cowards hiding in the shadows". "What we have had from day one - in fact from a number of weeks previously - is orchestrated rioting by violent republicans in order to create a reaction from the police to justify their actions," he said. "It is quite deliberate and it is straight out of the republican terror manual, where grown men coerce children to do their vile dirty work for them." 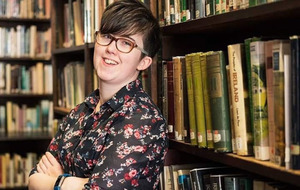 Alliance Party leader Naomi Long said: "It is clearly a deliberate attempt by dissident republicans to intimidate a minority, raise sectarian tensions and recruit a new generation of young people to their activities. "With worrying reports of children as young as eight years old taking part, it is nothing short of child abuse. It exposes those orchestrating the violence for what they are: mindless thugs who care nothing for the local community and are willing to put children at risk of injury or worse." Chairman of the Police Federation, Mark Lindsay, described those involved as a "pitiless, heartless bunch of cowards". "In the teeth of such attacks, our officers continued to safeguard people and maintain the rule of law, and that is a tribute to their focused and unwavering dedication and determination," he said. 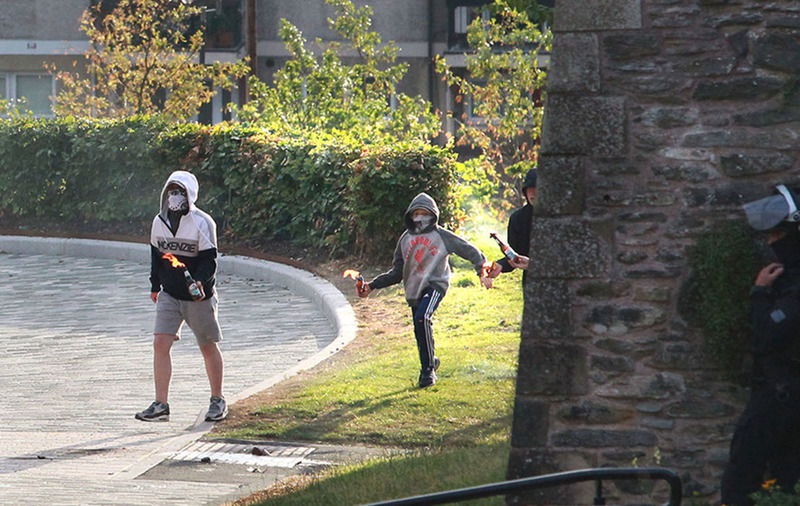 "The terrorists who skulk in the shadows get children - some no older than 12 - to do their dirty work by firing petrol bombs, bricks and bottles at police lines. "Once the police engage, the bomber and gunman take control and they really don't care who gets in the way or who is hurt in their indiscriminate attacks." Secretary of State Karen Bradley said: "The disorder in Derry last night, including targeted attacks on police vehicles and others, was completely unacceptable. These sustained attacks have been widely condemned and must end. "My full support goes to the PSNI and others who are working so hard to end this intolerable violence by a small minority."